For Dior’s Haute Couture spring/summer 2019’s collection, Creative Director for womenswear, Maria Grazia Chiuri, founded another side of Christian Dior who loved going to the Cirque d’Hiver, which is where, in 1955, Richard Avedon, who intuitively captured the essence of Monsieur Dior’s style in an extraordinary way, took his famous photo, Dovima and the Elephants, an image that perfectly evokes the wonder and majesty of haute couture. In 1950, British television also covered the House’s show at The Savoy in London with a report titled Dior “Circus” Comes To Town. 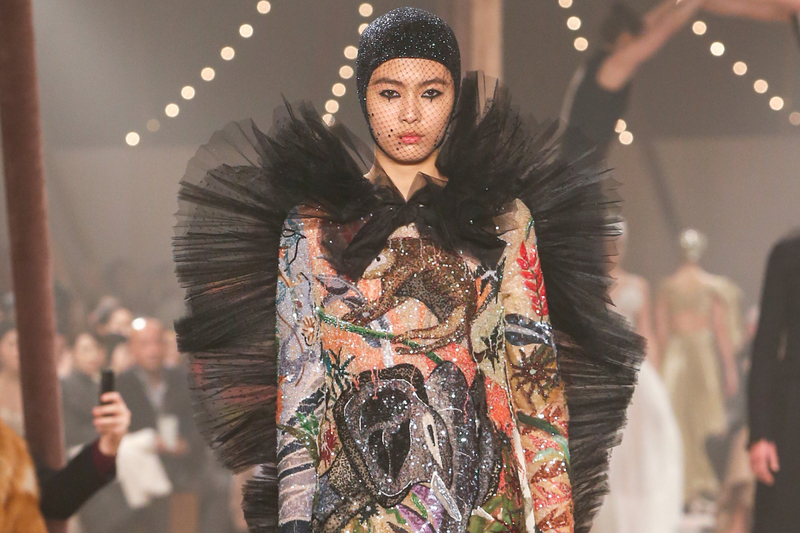 For Chiuri, this fantastical creative chaos provided the starting point for the spring/summer 2019 haute couture collection. The visual unfurling of the pieces that compose it represents an unleashing of the memory and the image associated with the circus through costumes, fashion and art, extending and the evocation of Cindy Sherman’s work focusing on clowns. This collection consists of a superposition of images: a woman’s tattooed skin, reminiscent of the Victorian circus and its fairground phenomena, becomes a motif-drenched unitard that shapes the body and tells a wearable story under dresses. Powdery shades that come together and blend into an infinite palette – like those on the curtain painted by Pablo Picasso for the ballet Parade – also symbolise this sense of the worn, of the fine dust that sprinkles stage clothes. Skirts embroidered or inlaid with opaque sequins are shortened as tutus that nod to the circus codes of acrobats, tamers and riders. Chiuri employs this broad variety of images to compose her own “parade”, comprising full and very light pants, narrowing at the ankle, which can also become sumptuous jumpsuits. Shorts are paired with sheer white shirts accented with ruffs or ribbons seemingly frayed with the passage of time. There are also leather corsets, sailor stripes, and black jackets inspired by that of the lion tamer. The geometric white clown outfit, whether spare or sumptuous, is reinterpreted through its materials, embroidery and proportions. The show is animated with performances by the all-female circus company Mimbre, which, in a constant search for the poetic in the unexpected, highlights the trust and bond between the acrobats’ bodies. The circus is presented as a place of inclusion in which the clown, through its androgynous and asexual dimension, becomes the expression of possible equality and an evocation of modernity, one where beauty, origin, gender and age are no longer important, and only technique, and daring matter.